On the basis of the number of times recumbent riders are told they are invisible, my daughter once observed that there must be a number of people wandering about shouting "I can't see you!" to bits of fresh air just on the offchance that there's a recumbent rider there to hear it. I have recently been invisible four times but it is now official: yesterday I was told so by that well-known authority Some Random Motorist. The odd thing is my brother had just sent me a link to this droll video. but to my amazement he not only swung hard over to the left, but as soon as he made contact with my shoulder kept on going, pushing me as hard as he could into the wire fence. I yelled "Hey! What are you doing?" I was about to brake but realising I was a much stronger rider than he was, I accelerated past him into the clear. "Where's your bell?" he demanded. "What? Didn't you hear me call 'on your left'?" "You should have a bell." "You have to have a bell. I've got a bell." I wasn't sorry, actually. I was just astonished to have been attacked by a fellow cyclist though I think he must have still been in motorist mood. His bike was a shiny new heavy full-suspension steel piece of Repco garbage which in my hands would have outlived the hacksaw by no more than three minutes. Thursday's invisibility incident also involved a cyclist, who without any warning at all suddenly veered across the road just as we were overtaking on the tandem. My stoker did the "Watch out!" scream while I operated the brakes, and all was well. I think the cyclist had lost the will to ride on the left or something. 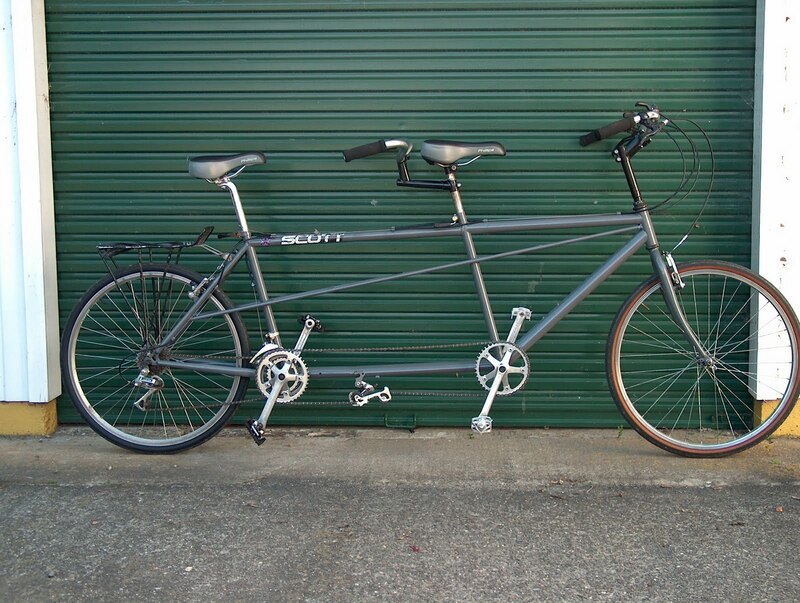 Invisible tandem. This does have a flag, to alert following traffic that one arm signal might mean two riders turning. The day before's invisibility incident was serious but it was over in a flash and I only realised after the event what had happened. I was going through town behind a large van and just past the Pah Street crossroad, a huge oncoming 4WD deftly cut in behind the van to take advantage of what he evidently saw as a tiny gap in the traffic. Unfortunately I was the tiny gap. Fortunately I was pretty close to the nearside back of the van so he just missed my back wheel. In hindsight I should have been riding out in the middle of the road. The difficulty of leaving a safe distance between a cyclist and a car is that motorists behind you get frustrated and angry, and sometimes overtake dangerously to fill up the gap. "You know why that driver couldn't see you?" "You're going to tell me it's because I'm too low and I should have a flag, and you're wrong. If anything it was because he wasn't paying attention." "I've been a cyclist and a car driver, and you were in the shadow. You are very small and hard to see." I do find it wearisome when people with neither evidence nor insight tell me things they fondly imagine I haven't daily thought about for twenty years. I took off my sunglasses to make polite eye contact, and I took off my helmet so he could see I wasn't some teenage whipper-snapper. "If you just look at me for a moment," I said very deliberately, "I'm a lot higher than a toddler who could easily have been your grand-daughter accompanying you on the bridge. I'm bigger than a stray sheep which you sometimes see on these rural roads. This fluorescent yellow jersey is brighter than a farmer's huntaway, and I am taller than the biggest wild boar which - as you know - every single driver in New Zealand will both see and stop for, if there happens to be a wild boar on the road. The truth is that driver swung onto the bridge without paying any attention to the possibility of sunstrike." "You need a flag. He would have seen you if you'd had a big flag." "People don't see you merely because you have a flag. Years of cycling have taught me that people see what is unusual, and I'm safer on this bike than on an upright bike. And if we momentarily revert to the facts, he not only saw me, he had time to wind his window down." "But you startled him! He was frightened! You need a big red flag!" "D'you know there once was a Red Flag Law, to prevent horses being frightened by automobiles but it was repealed in 1896. Mindless creatures are often frightened by the unfamiliar. In America there was even a law requiring motorists to take their horseless carriages apart and hide the bits behind a bush, which still seems to me to be quite a good idea." "I've been on two Defensive Driving Courses - "
I was in no mood for a prolongation of this patronising moron's lesson. "If you've been on Defensive Driving courses you will have been taught never to put your car where your eyes and your brain haven't been. I'm well aware that people drive without thinking what they're doing. It's a hazard we face whether we're in a car or on a bike. But it's kind of you to think about my welfare. Thank you for stopping to tell me." He was not happy. He wanted to assert road seniority, as if the possession of a car gives you greater wisdom than you could ever have as a cyclist. But if he's lucky I'll get killed next week and then he can feel smug when he reads about it in the paper. If I'm lucky I'll only get told I look really uncomfortable or be asked where me fookin' 'andlebars 'ave gorn mate, and then I'll know time has stopped and we're back at the birth of the human power movement. There must be something about bridges that brings out the inner Idiot. A few years ago a group of some half-dozen Bicyclists of both the upright and lying-down persuasions, of whom I numbered one, were nearly forced into the river Weaver by some clown who "didn't see you". In this case we actually were invisible, as he had only cleared an area of his windscreen of ice to the size of a side plate. So we killed him, and then had an ice cream.